Republican presidential nominee Donald Trump has aroused new controversy by declaring that the 2016 presidential election is “rigged.” On the one hand, that is both an irresponsible statement, and also a potentially self-destructive one. On the other hand, it may be true. It is irresponsible to claim the election is “rigged” for the reason most of Trump’s media critics have suggested — namely, that by casting the result as illegitimate, Trump is ensuring it will be harder to unify the country afterwards. As a factual matter, it is impossible to know whether the election result on November 8 will be “rigged” — that is, if it will be affected by ballot-stuffing, hacking, voter fraud, and so on. Past experience suggests that fraud does have an effect — just ask former Minnesota Sen. Norm Coleman how he lost to Al Franken in 2008 — but given the sheer variety of jurisdictions that run a typical presidential election, the nationwide effect of voter fraud may be much harder to measure, and probably small. What we do know is that important parts of the election have, in fact, been “rigged,” both in the literal and figurative sense. The Democratic Party primary was certainly rigged against Sen. Bernie Sanders (I-VT), both openly and secretly: openly, in the sense that the Democrats’ undemocratic superdelegate system is designed to thwart insurgent candidacies; secretly, in that the Democratic National Committee and parts of the media were colluding with Hillary Clinton, as revealed by Wikileaks. More broadly, the election has been “rigged” because of the brazen corruption of the nation’s system of law enforcement, such that Hillary Clinton evaded prosecution for mis-handling classified information and destroying government documents — acts that would have landed anyone else in prison. What occurred behind the scenes in 2012, when the IRS silenced conservative non-profit groups, has occurred in the open in 2016: the partisan abuse of the state apparatus of law enforcement (and intelligence, if the reports of “Russian” hacking are unfounded). Were the United States a third-world country, international monitors would report the FBI’s sham investigation and the Justice Department’s cozy arrangement with the Clinton family as signs that the election that followed would be neither free nor fair. Republican voters, at least, feel that the election is being “rigged” in the sense that the media are hell-bent on destroying their candidate. That is not, properly speaking, how an election is “rigged.” The media are generally private actors, even when they are pro-government. And there are alternative media, such as Breitbart News and others, that provide a counterweight to the twisted mainstream. Moreover, the media are always against the Republican Party and its candidates, even if they are more openly so in 2016 than they have ever been before. If this election is “rigged,” then so are the many past elections — most recently, 2014 — when the media tried to sway the result in favor of the Democrats and failed. But what feels wrong to many Republican voters is that the slew of sexual allegations against Trump have arrived so late in the process. All of the accusations are many years, and even decades, old. There was no reason to withhold them during the Republican Party primary, when voters could have chosen an alternative. And so many Republicans feel the media is trying to nullify their votes. 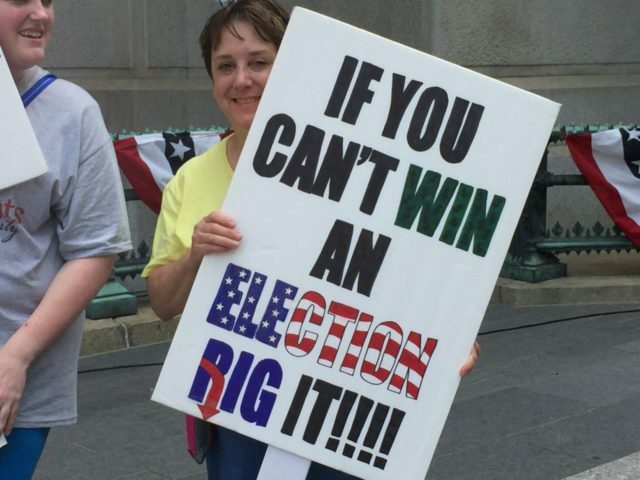 To them, the election is indeed being “rigged,” albeit legally. Luckily, they still have a chance to respond.